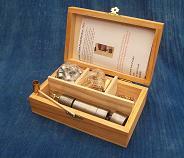 Full reloading set for 10.40mm Italian Service Revolver. 10.40mm Italian revolver dies and tools, 25 lead bullets, 12 reloadable brass cases, 25 LP boxer primers. Manual tools for 10.4 /10.35 italian revolver. In wooden box.